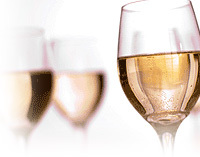 Riesling is one of the world’s most versatile white varietals that can be produced in a range of style from bone-dry to extremely sweet (for dessert wines). Enjoyed by casual wine drinkers for its easy fruitiness and prized by connoisseurs for its complexity, ageworthiness, and ability to reflect its terroir (vineyard characteristics in which it was grown). Riesling has excellent natural acidity and when produced in a light drier style can offer lively floral citrus notes, an underlying mineral complexity, and a mouth-puckering limey tanginess. In the sweeter wines, this natural acidity helps balance the sweetness of such flavors as peach, apricot, lemon curd, baked apples, and ripe pear. As Riesling ages, it takes on honeyed petrol notes that may surprise some but is considered nectar to devotees. It generally is not oaked. Scallops in cream sauce, lightly breaded veal cutlets, rabbit, light chicken and pork dishes. Spicy Asian and Indian fare, duck, rich pork dishes. White fruit tarts (apple, pear, lemon), meringue, biscotti, crème brulée.